Jeffrey Chappell first gained national attention at the age of 24 by substituting for Claudio Arrau on four hours’ notice without rehearsal, performing the Brahms Second Concerto with the Baltimore Symphony to critical acclaim. 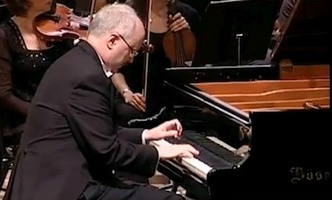 Now a seasoned veteran of the concert stage, he has appeared throughout the United States in recital and with major symphony orchestras such as those of Philadephia, St. Louis, Houston, Pittsburgh, and Indianapolis, collaborating with conductors including Catherine Comet, Sergiu Comissiona, Leon Fleisher, and Davin Zinman. He has performed in Europe, Latin America, and Asia, and has participated in music festivals including Marlboro, Piccolo Spoleto, and the La Gesse Festival in France. Wherever he goes, he garners standing ovations from audiences and glowing praise from the press such as, “Some rise above their colleagues in how well and originally they communicate. One of the latter is Jeffrey Chappell.–New York Times” and “His technique is mastered to the point that one forgets it. The heart rules the fingers.–Le Soir, Brussels” and “Chappell established an immediate bond between himself and the audience.–Brazil Herald, Rio de Janeiro”. He has appeared at venues such as Carnegie Hall, Alice Tully Hall, The Kennedy Center, and Wolf Trap Park and is a recording artist on multiple labels. You can find more detailed information on this website under “Bio”. You can read more of what critics said about his performances under “Reviews”. You can find a complete listing of the orchestras and conductors he has appeared with under “Orchestras”. Jeffrey Chappell’s “The Definitive Guide to Mastering Music Improvisation” is a bestseller on udemy.com, a leading online video course platform. You can click to download a pdf of his Improvisation Exercises. He is also the creator of Music Everybody, a weekend music seminar series. He has given master classes nationally and internationally. He is on the piano faculty of Goucher College in Baltimore, Maryland where he is also Director of Jazz Studies and was the director of the Goucher Summer Arts Institute Jazz Camp for middle and high school students from 1999 to 2013. He also teaches at the Levine School of Music in Washington, D.C. and at his home studio. He is on the faculty of the Alba Music Festival in Italy, teaching piano, chamber music, and jazz. You can find out more about his teaching activities on this website under “Teaching”, along with three instructional essays about piano playing. You can find his responses to questions from students and website visitors under “Answers”. Jeffrey Chappell has recorded on the Telarc, Centaur, Albany, MMC, MSR Classics, and Petrichor labels. His most recent release is the debut recording of the contemporary jazz quartet, Otherworld, which won a Global Music Award. His compositions and arrangements appear on three Centaur Records releases: “Jazz Sonata” and “Pick It Up” for solo piano; and “Clarinet Now” for piano and clarinet. He is the pianist on “Crosscurrents”, an Albany Records release with saxophonist Noah Getz, featuring works by classical composers influenced by jazz. Mr. Chappell also made the world premiere recordings of the Piano Concerto by James Grant and “The Dream Wanderer” by Sotireos Vlahopoulos. He is the featured pianist on the Baltimore Symphony recording of Stravinsky’s “Petrouchka” conducted by David Zinman. You can find a complete catalogue of his recordings with purchase information on this website under “Recordings”. 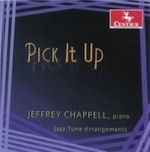 The compositions of Jeffrey Chappell integrate techniques of classical composition with elements of American popular music. He has written music for piano solo, piano and orchestra, jazz ensemble, guitar, and chorus, as well as works for musical theater through participation in the BMI Advanced Musical Theater Workshop in New York City. 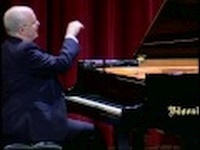 His solo piano composition “American Sonata” won the Keyboard Magazine Soundpage Competition. While composer-in-residence with the Mid-Atlantic Chamber Orchestra, Jeffrey Chappell was commissioned to write “Shadowdance” for piano and wind ensemble with a grant from the Meet The Composer Foundation. Scores for his original solo piano compositions are available at the music store on this website as downloadable PDF files. Jeffrey Chappell is the pianist in the contemporary jazz quartet, Otherworld, which won a Global Music Award for their debut album. He has appeared as a pianist at the Key West International Jazz Festival and as a jazz band conductor at the East Coast Jazz Festival and in Washington, D.C. area venues. He has performed with jazz artists such as Pepe Gonzalez, Jeff Antoniuk, Wes Crawford, Jon Mathis, and Seth Kibel. He was the pianist and arranger for DC Express, a jazz vocal quartet, and was a member of the Lenox Ensemble, an improvisation group of classical musicians. He has frequently improvised piano accompaniment for silent films at the National Gallery of Art. You can find more information on these activities on this website under “Jazz”. You can click to download a pdf of his Improvisation Exercises. As a contributing editor for Piano & Keyboard Magazine from 1994 to 2000, Jeffrey Chappell reached an international readership with his feature articles and reviews. His writing has also appeared in Clavier Magazine and Clavier Companion Magazine. He has written on topics such as the future of the piano, the teaching of Artur Schnabel and Leon Fleisher, an explanation of jazz for classical musicians, the piano music of Gabriel Fauré, and a biography of Scott Joplin. You can find these and more of his articles on this website under “Articles”. Jeffrey Chappell is also the author of “Answers From Silence”, an internationally bestselling book about spirituality published in December, 2009 about which you can learn more at the Answers From Silence website. Jeffrey Chappell was the Artistic Director of the concert series at the Sandy Spring Museum from 2010 to 2014. The mission of the series was to present the finest artists from the Maryland region and beyond, in the categories of piano, ensemble, vocal, instrumental, world music, jazz, and up-and-coming artist. A small sample of featured artists includes Solomon Eichner, piano; the Peabody Ragtime Ensemble; Mary Bonhag, soprano; Lydia Artimiw, piano and Marcy Rosen, cello; Karen Kevra, flute; Kwame Ansah-Brew, African drums; Gretchen Richie, jazz vocals; and Dariya Bukhartseva, pianist.